by James F. Clapp III, M.D. Before I get into the details of why I love this book, let me just tell you to run (if you can) to your local book store and buy this book. Please don’t be turned off by the cover model’s floral capri leggings or her awesome pink shoulder pads and hand weights. You can even chuckle if you need to…I *might* have. Joking aside, this is an absolute “must have” for any pregnant runner or any mama-to-be who is concerned with exercising throughout the duration of her pregnancy. When I found out I was expecting I immediately started scouring books and the internet for as much information as I could find. While I did get some guidance from my doctor, I wanted more. 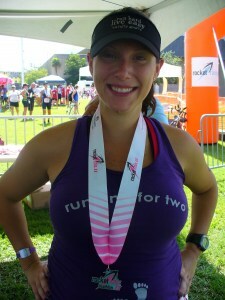 I wanted to hear from other women, I wanted to know their stories, and I wanted to find something scientific to tell me that exercising was okay for me and my child. While I did appreciate the books and articles by dietitians and fitness gurus and mavens, I wanted information from a doctor. I wanted actual research. Research and facts were something I felt I could trust and be confident in. Finding medical research (that cites actual case studies) was difficult. 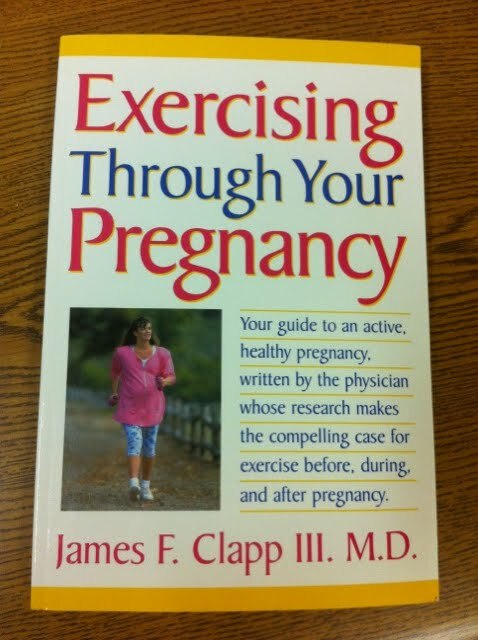 There was so much heresay and so many articles that said, in general, exercising through pregnancy was okay, but nothing could really tell me exactly why…until I found this book. “Exercising Through Your Pregnancy” explores every topic related to remaining fit through your pregnancy including the many physiological benefits (for both mama and baby); how exercise affects breast-feeding, milk production, and fetal growth; and how exercise affects your body differently during preconception and early pregnancy, mid- and late pregnancy, and postpartum. Another thing I really appreciate is that this book explores the psychological and emotional ties that exercise has for the expectant mother. As many of us who regularly exercise know, running or maintaining a level of fitness is every bit as mental as it is physical. • Pregnancy does not limit lung function of the mother, and both pregnancy and exercise improve the ability of body tissues to take up and utilitize oxygen. • Continuing regular, vigorous exercise throughout pregnancy DOES NOT increase the incidence of either membrane rupture or preterm labor. • The newborns of women who exercise don’t have trouble with the transition to life outside the uterus and tend to be more alert and easier to care for. • Regular, vigorous, aerobic exercise at moderate to high intensity DOES NOT alter the quality or quantity of breast milk in women. Again, if you are looking for solid information that you feel like you can really rely on, definitely check out this book. Baby Key and I give it two…well, four…thumbs up! You can read more from Katie on her blog katieRUNSthis and on Twitter! Look for more from Katie right here, as she shares her pregnancy journey with us! What do you think about this book? What are your favorite resources for pregnancy advice? The post "Exercising Through Your Pregnancy" : A "Four Thumbs Up" Review appeared first on Fit Pregnancy Starts Here - The For Two Fitness Blog.